Living in a fast-paced city means that the people of Mumbai really look forward to the weekend — especially if it’s a long one! And there’s nothing better than a getaway close to the city to make the most of your free time. If you’re thinking of a short break, then gather your friends and drive down to one of these beautiful waterfalls near Mumbai where you can escape from the chaos of everyday life and just relax amidst nature. Here’s our guide to some of the best waterfalls near Mumbai that you should experience. Located in Kharghar, the Pandavkada Falls stand at a height of 107 metres. It is very popular for families and large groups for one-day picnics. The falls are not safe to swim in, so it’s best to just enjoying the view or for a short trek. 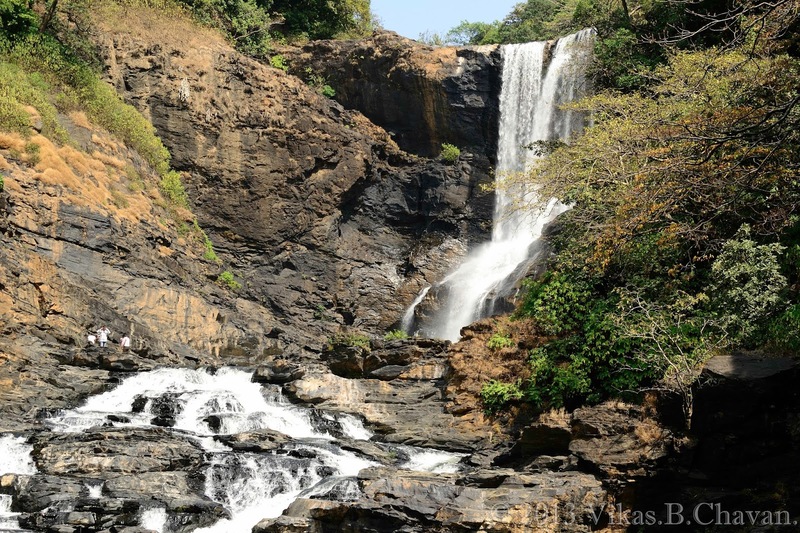 The Pandavkada Falls are located conveniently near the railway station, so getting here shouldn’t be much of a problem. It can get a little crowded, so head there early if you can. Getting There: To get here take a train to Kharghar and then hail an autorickshaw from the station that will take you to the base of the waterfall. You can also travel by road from Mumbai to get here. A visit to these falls makes for a relaxing road trip. Along the way, you will come across a few houses, vast open spaces of greenery and some beautiful rock formations. Once you reach the waterfall, there is a clear pool of water where one can swim. On weekends, a few nature and adventure camps are held at these waterfalls, which are fun to attend as a group. They have rock climbing, water rappelling and other exciting outdoor activities to try out as well. Getting There: To get here take a train to Vangani station and then take a taxi or auto-rickshaw to the waterfall. A rickshaw should cost you less than Rs. 100 per person. 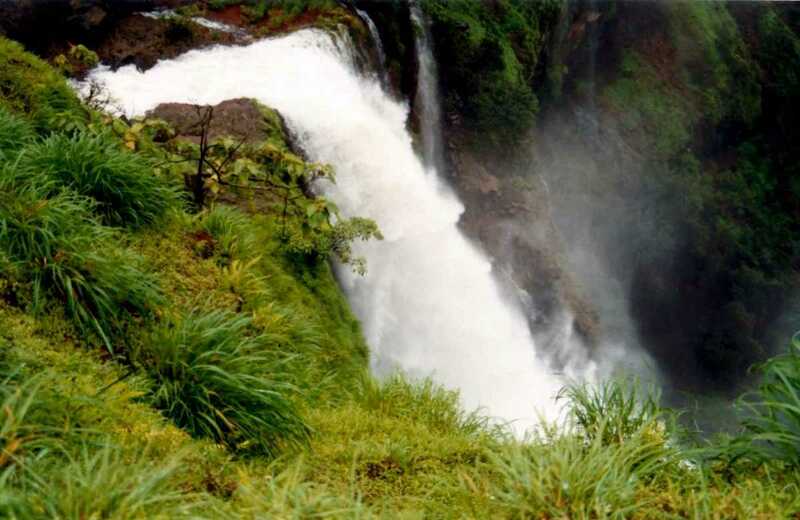 Getting to Bhivpuri waterfall is an enjoyable 30-minute trek that takes you through lush greenery. To enjoy the most of what the waterfalls have to offer, try going in the monsoon, when the fall is at its full force. There are three levels of waterfalls here. The topmost one is the most difficult to get to but if you can manage, the view from the there is magnificent. The other two are ideal for first-time trekkers — however, make sure you carry good shoes as the slope can get slippery. There are a few locals who offer typical Maharashtrian cuisine at the foot of the hill for a nominal fee if you want to grab a bite after your trek. Getting There: You can drive down along the Mumbai-Bangalore Highway or take a Karjat local to get to Bhivpuri. 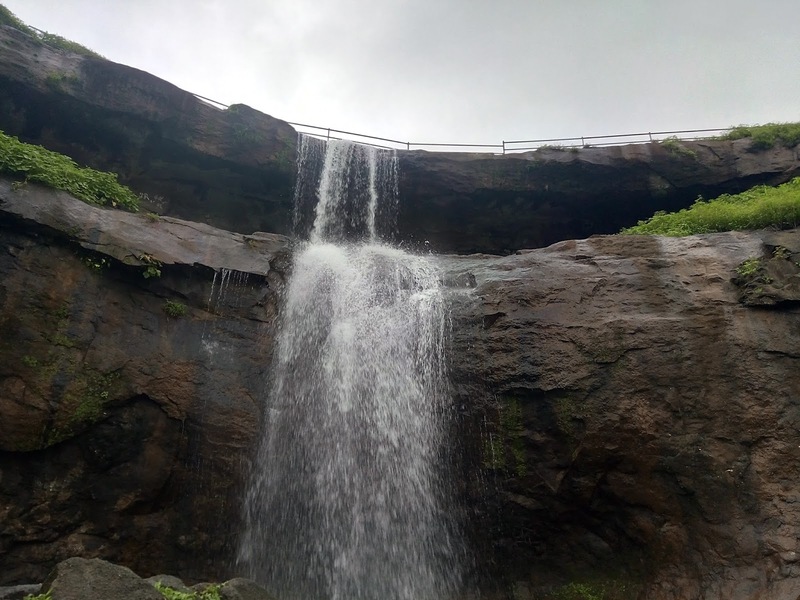 If you’re visiting Khandala then you must visit the popular Kune Waterfalls that is merely 2 kilometres away from the Khandala Railways Station. Set against the backdrop of the Sahyadris, the Kune Waterfalls lie at an altitude of 622 metres. The landmark for reaching the Kune falls is the Kune Church, the falls are located a few metres away from the church. The best time to visit is during the rainy season when the waterfall is at its peak and it cascades down beautifully with a huge gush. It can get a little crowded due to its popularity and proximity to Khandala and Lonavala, so do try to head out early. Getting There: One can take a train to Khandala Railways Station and then hail a rickshaw. If you are going by road, you need to take a detour from the NH48 highway onto the Kune Village Road. Also known as the Ashoka waterfall, the Vihigaon falls are situated about 60 kilometres away from Nashik, so if you are visiting this wine region, do plan a day trip to the falls. The area offers splendid views, with the cascading effects of water burbling down from the peak of the mountain. The drawback of this place is that it’s only good to go during the monsoons (June to September) when the water is in full force. During the rainy season, there are a few adventure sports companies that organize river rafting and rappelling here. Keep in mind that the falls are quite a distance away from the city with limited access to resources, so it is advisable to carry your own water and food. Getting There: The best way to reach Vihigaon is by taking a bus or cab from Nashik bus station. It shouldn’t take you more than four hours to reach from Nashik. 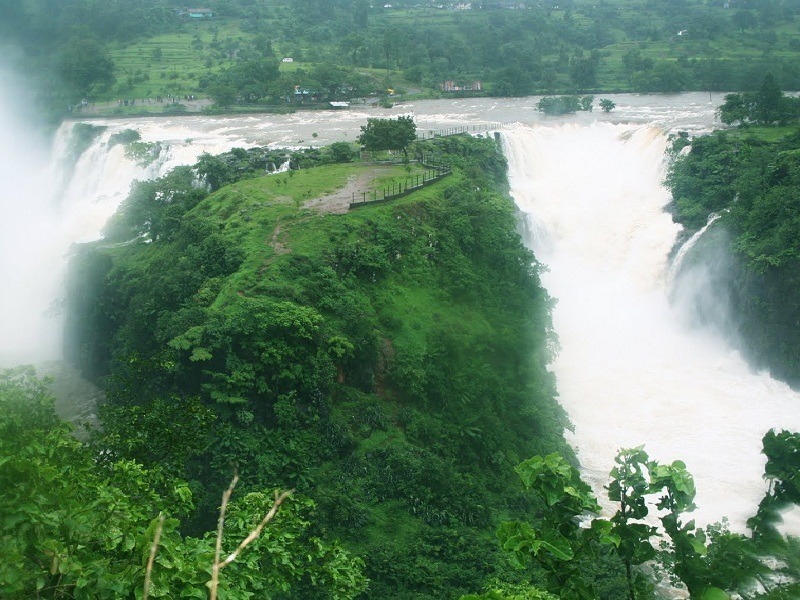 The Randha Falls is around 10 kilometres away from Bhandardara and are ideal for a one day trip. It is one of the most famous waterfalls in the locality and is visited by thousands of tourists. Here you can see the 170-feet-high falls gushing into the gorge. The best time to visit here is during the monsoon (June to September). From the top of the waterfall, one can enjoy pristine views of the surroundings and gaze at the fog clad mountains. For those who don’t want to make the climb up to the waterfall, there is a well-constructed pathway you can take. Getting There: To get to the Randha Falls, you will have to drive down the MH SH 44 and NH160 highways. Located at a slight distance from the main Mahabaleshwar city centre, the Lingmala Waterfall is a must visit for anyone travelling to Mahabaleshwar. It is one of the few waterfalls that is active nearly throughout the year. At this place, you have two options of getting to the top of the waterfall, you can either trek, or take the stairs, carved out of rock. Just below the waterfall is a pond where you can swim. The best time of the day to visit the falls is in the morning, avoid going after dark as the place can get quite lonely. Getting There: Lingmala is about a 4-hour drive away from Mumbai via the NH48 & Bangalore-Mumbai Highways. History has it that many years ago, the Chinese people took care of the garden near this water body. Hence these stunning falls were named Chinaman’s Waterfall. It is ideal to visit these falls for a day trip if you are staying at Mahabaleshwar as they are located just 3 kilometres away from the Mahabaleshwar Bus Stop. The highlight of visiting this is waterfall is to see two falls merge into a single stream. The best time to see this is during the monsoon as that’s when the water flows continuously. To see the waterfall in all its glory, trek up to the Babington Point, from where you can enjoy the best view of this natural beauty. Getting There: Take a bus or hire a cab from the Mahabaleshwar Bus Stop to get to these waterfalls. Although the Vajraj Falls sees water cascading from the top all through the year, it is best to visit in the monsoon. And the unique thing about these falls is that it is one of the few in Maharashtra with three tiers, which adds to the stunning view. To get to the top of the waterfalls, one will have to make a 500-metre trek, that is not too difficult. But make sure to carry a good pair of shoes. Along the way, there are a few caves, that are worthy of exploring. There is a lovely pond here where you can relax, however, swimming in it is not permitted. Getting There: You can go here by your own vehicle or take public transport from Satara Bus Station. To experience nature at its best, visit these falls that offer stunning beauty in lush surroundings. Known for its green environs, the falls are often a favourite of tourists looking for a place to relax, unwind, and refresh their minds. Entry to the main portion of the waterfall is restricted; however, at the top of the mountain, there is a viewing point from where visitors can catch a fabulous view of the waterfalls. To get the viewing point, one has to walk a fair bit. But, the walk is enjoyable with the flora and fauna around. And once you reach the top, you’ll realise it was worth the view! Getting There: The best way to reach the Thoseghar Falls is from the Satara Bus Station. The falls are around 23 kilometres away from the Satara Bus Station. So, if you’re looking for a quick and refreshing getaway to recharge your batteries, then consider these beautiful waterfalls near Mumbai. Do share your experiences and recommendations in the comments below. What, according to you, is the best waterfall near Mumbai? Happy travelling!